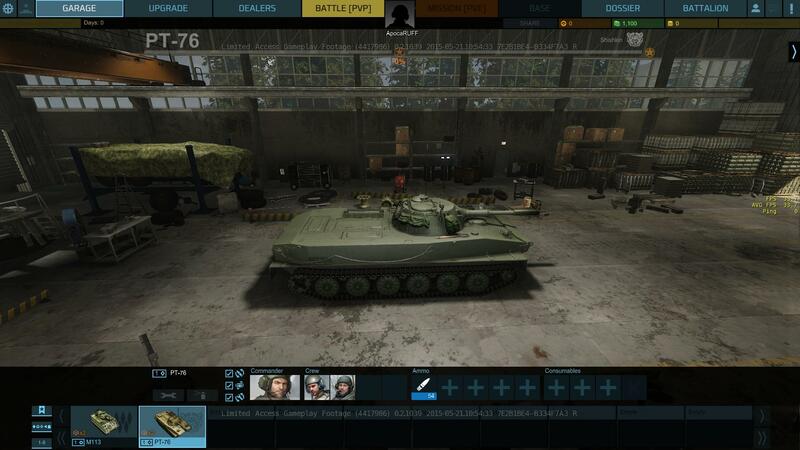 Last Thursday and Friday I was given access, along with other Journalist and Youtubers, to partake in a first look at the Early Access build of Armored Warfare that will be released on May 27th. The test took part in two parts, with the first part focusing on early gameplay and the second on more advanced tiers of gameplay. We were able to play on four maps, including a newly released map called River Point, and had access to thirty-eight vehicles over five classes. We also got to experience some gameplay tweaks and systems that weren’t previously in earlier coverage of the game. Needless to say, the chance to cover this first Early Access build of the game was extremely exciting. 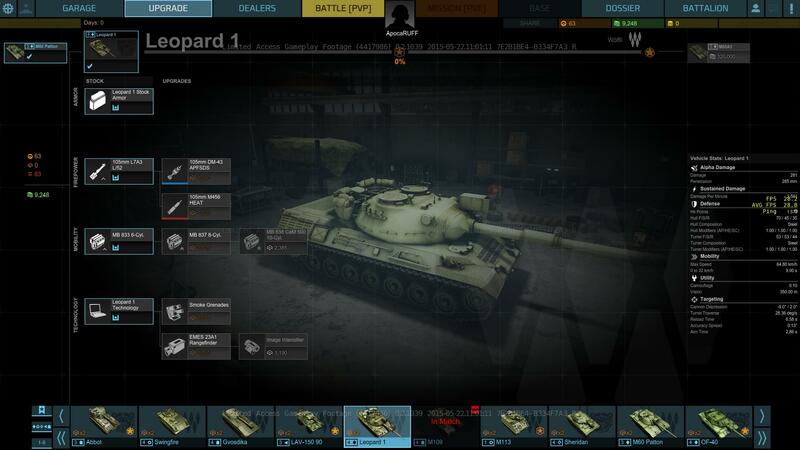 First, I want to talk about the tanks in Armored Warfare. Unlike other tank games that usually focus on World War II era tanks or those that made an appearance not so long after, Armored Warfare focuses on tanks in more modern times. So while you have the traditional guns and artillery, you also get things like smoke screens and missile launchers. Heck, some of the Armored Fighting Vehicles (AFV’s) will only be armed with missiles and no other weaponry. Needless to say, this adds a whole new layer to the genre and it’s something I’m surprised other games haven’t capitalized on sooner. The tanks themselves fill five different classes. There’s AFV’s, Light Tanks, Self-Propelled Guns(SPGs), Tank Destroyers and Heavy Tanks. So far the devs have done really well with making each class quite different in gameplay style, but still leaving room for you to surprise your enemies from time to time. As a Heavy Tank you’re usually pretty sure that you can take a Light Tank from afar, right? Well not so much when a missile is heading your way. The tanks are detailed and look fantastic. In my opinion, at least in this Early Access build, they’re not as detailed as War Thunder’s tanks. 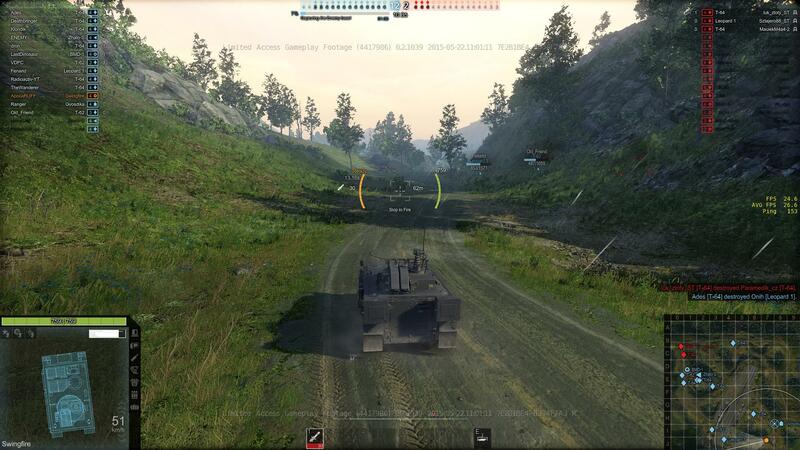 But they do look comparable to World of Tanks. One thing that stuck out to me is how good the treads looked, especially when going over terrain. 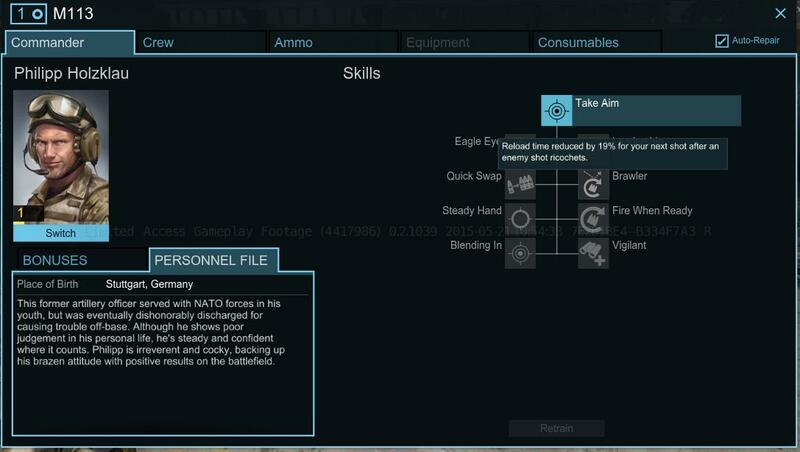 I love it when a game pays attention to seemingly little details. And, of course, as the game is still in development there’s definitely reason to believe the the graphics will improve over time. Next up are the maps. As I said in the introduction, there were four maps available to us during the test. Personally, the two that stuck out to me the most were Ghost Field and Cold Strike. Usually any map with snow in it would be my favorite, so I was surprised to find that Ghost Field turned out to be the one I enjoyed the most. This is because of how atmospheric the map is. All the maps are quite atmospheric, actually. Each one feels alive with helicopters and jets flying over head, or a convoy of military vehicles traveling down a nearby highway. And the sounds are amazing, too. I can’t think of a game where the jets sounded so intimidating. Each map has something towards the beginning to help set the mood, too. One map has a plane being shot down right as the match starts and it goes down, crashing and exploding in the city where most of the combat takes place. Ghost Field has a jet taking off in the beginning, from the central airfield. 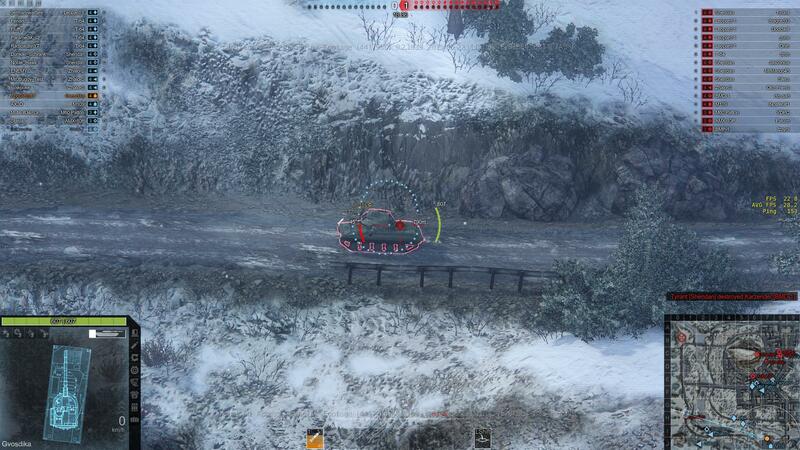 Like I said, I really like the (relatively) small details that Armored Warfare devs have put into the game. They didn’t need to put in any of those sequences, but they did and it added a lot to the experience. The first session was on Thursday and we had to start from scratch, to help give us an idea of the early gameplay and progression. I was able to reach tier 2 easily enough and could have probably gotten up to tier 4 with another hour to play. The gameplay at this tier was quite fun, as battles were a lot more forgiving. 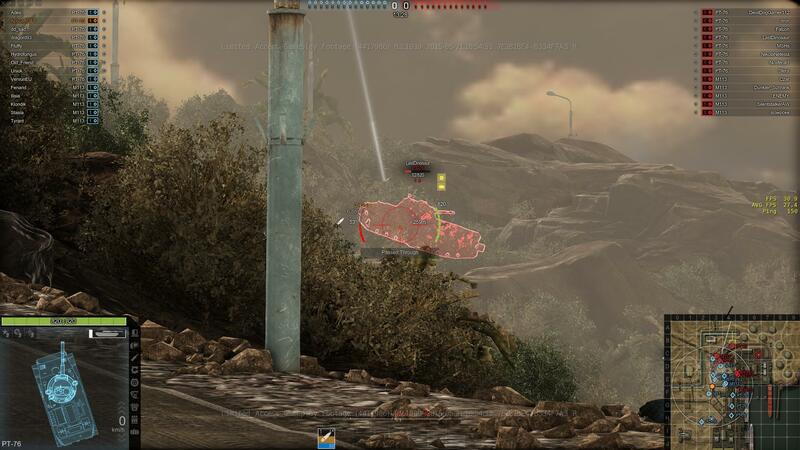 While you still could get one-shot by accidentally leaving a piece of your tank exposed, it didn’t happen often. There also weren’t any SPG’s to wreck you from out of nowhere and (for the most part) people were using the same two or three vehicles, making it easier to figure out how to deal with each type of tanks. 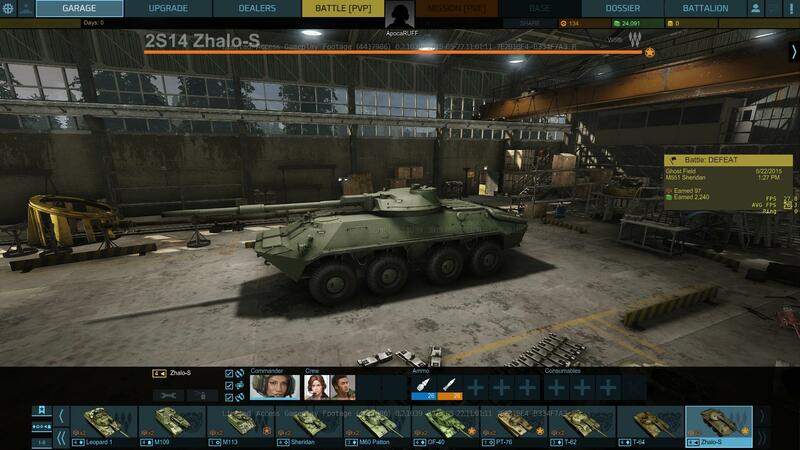 So far, there are two “Dealers” for tanks within Armored Warfare. One Dealer offered an M113, which looks a lot like an armored personnel carrier with a rapid-fire gun. 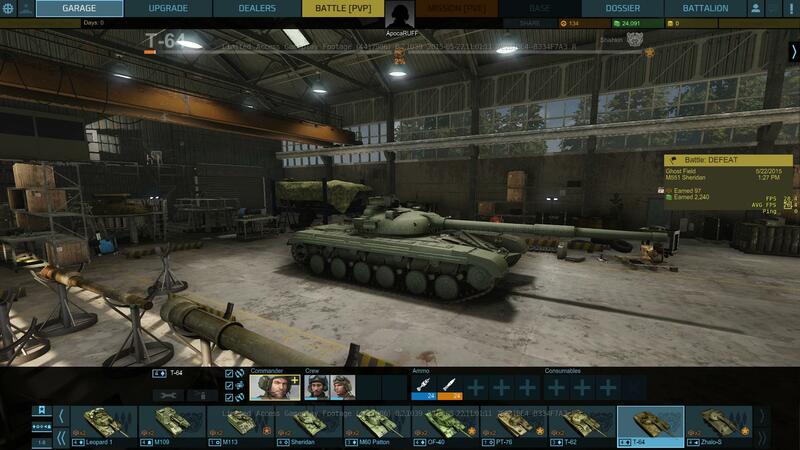 The other Dealer offers a tank that is more traditional – slow, hardy, and with a strong – if slow – gun. I found myself going for Marat “Might Makes Right” Shishkin’s tanks, which were of the more traditional variety. So I started out with the PT-76 and quickly upgraded to a Scorpion. Most of my time in the test were spent in those two tanks, and I actually found myself preferring the fully-upgraded PT-76 after a few matches. Don’t get me wrong, it was fun zipping around in the smaller faster tank, unloading shot after shot into an enemy as he tries to get his turret around to shoot me. But I prefer a more calculated kill, sitting in the back of the battle and waiting for an enemy to reveal himself so that I can tank him out from a distance. 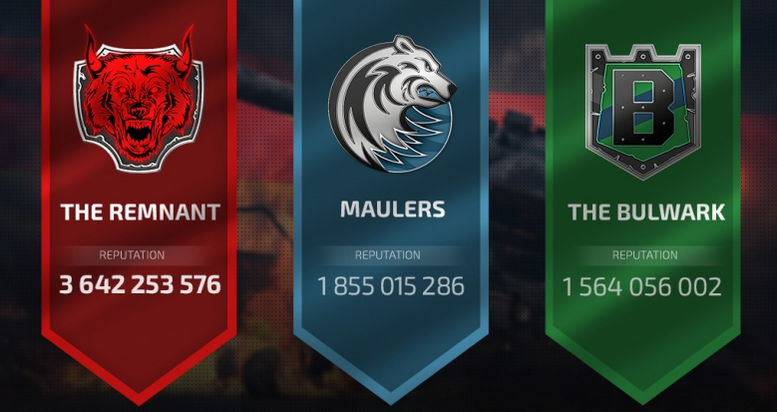 For the second session, which took place on Friday, we were given accounts that came decked out in Tier 3 and 4 tanks of each type. The tank of the day, for me and a number of other people, was the T-64. AFV’s and SPG’s were also available, so I got to play them as well. SPG gameplay is quite similar to the SPG gameplay in other tanks games. 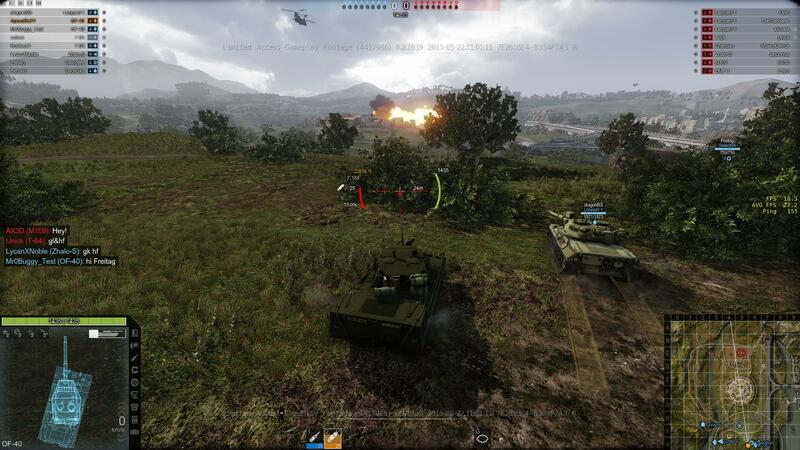 If you’ve played artillery in World of Tanks, you’ll know exactly what it’s like to use an SPG in Armored Warfare. AFV’s were interesting, especially those that made use of only missiles. Besides the T-64, I made use of a few different Light Tanks. Mostly because some light tanks also came with a missile launcher and I found myself enjoying that quite a bit. I was also introduced to just how bad I was at the game. There were a few names I saw popping up that just completely dominated the matches and it took a while to finally get an idea of what I was doing. The variety of tank types and weaponry introduced a lot of variables to take into account of while playing. For example, in the First Session it wasn’t so important to take cover and hide as the tanks weren’t very advanced and SPGs weren’t around. However, in the Second Session I found myself getting wrecked by an SPG when I thought I would have been safe more than a few times. The use of “Dealers” rather than nations is an interesting choice. Usually you would focus on what country the tank was made in instead of presenting it in a format where you are buying from a dealer, which makes you wonder about the games backstory. As there is a planned PVE Co-Op feature, I’m guessing more of that story will be revealed through that. Unfortunately, that option was grayed out during the test sessions so I didn’t get a chance to try it out. This is one of the features I’m looking forward to, though. 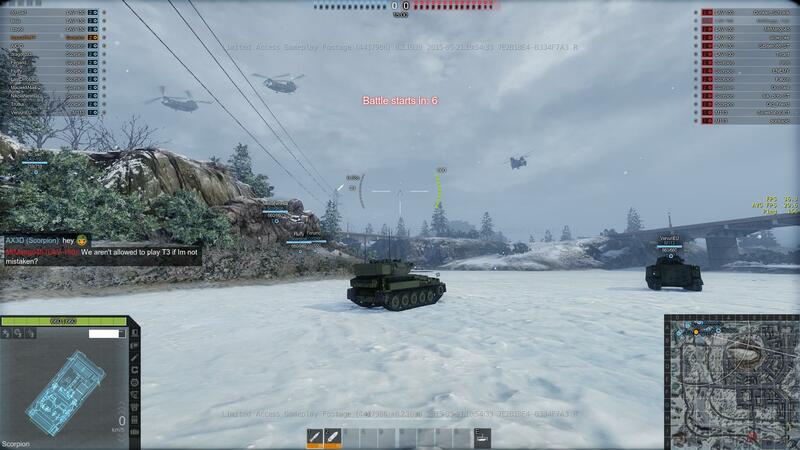 In general, gameplay in Armored Warfare isn’t much different than what you’ll find in War Thunder or World of Tanks. The control scheme is actually very similar to both, which is evident by the fact that I had never played Armor Warfare but was able to play just fine without viewing the controls by just using my knowledge of World of Tanks controls. So far, the game goal are also very similar – try to destroy all enemy tanks or, if you prefer, try to capture the enemy base. I’m not sure what game modes will be available in the future, or even if any other game modes will be offered. But I do hope something more unique and interesting is set up. 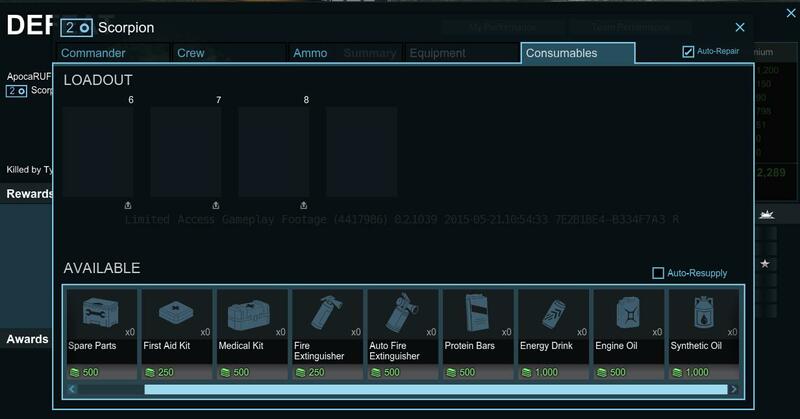 Consumables are available, which is honestly something I expected. You’ve got the typical things such as repair kits, fire extinguishers, and first aid kits. But you’ve also got Energy Drinks and a few other more interesting consumables. I didn’t find myself relying on them too often. Usually because when I did find myself in a situation where I might need a consumable, I usually died soon after. There is also an upgrade system. With each match, you gain two types of research points. 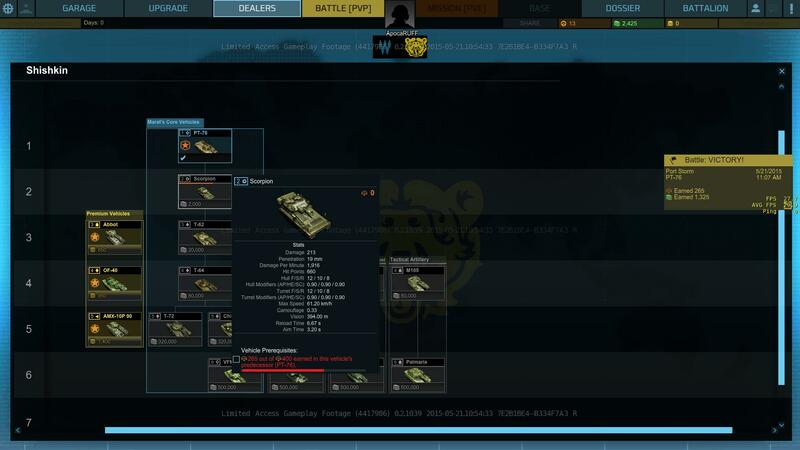 There are vehicle-specific points which are used to upgrade components of whatever tank you’re using. There are also global research points that can be used on whatever you like. At the same time, as you gain experience while completing matches, you can work towards unlocking more tanks within a certain Dealer. A really standard system that is used in both War Thunder and World of Tanks. Last up I want to talk about the crew. Similar to other games (I know, I’ve said this a lot in this article) the crew in Armored Warfare will level up as they gain experience. However, at certain points they will also gain the ability to gain new crew skills which will provide bonuses. For example, you could have your crew learn the Battering Ram skill to give you increased ramming damage. I think these are neat because they give you slight bonuses to certain types of gameplay and you are never sure just how a person has trained his crew. In the end, a lot of Armored Warfare is instantly familiar from other tank-based games. It doesn’t stray from the proven formula that World of Tanks has put together. It does, however, have more than a few unique twists to make it exciting and interesting. The focus on more modern tanks and weaponry is probably the biggest thing. I’m really excited to see how the game is improved and polished throughout the Early Access period. Keep an eye out on our site come Thursday as we’ll be giving away a limited number of Armored Warfare early access codes! We’ll also offer a chance for forum veterans to reserve codes as well so be sure to look out for the forum post from DizzyPW!